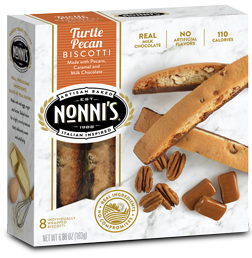 I don't really need a special reason to enjoy Nonni's Turtle Pecan Biscotti - they are sooo very yummy! However, why not celebrate National Pecan Day on April 14 by indulging a delicious portion controlled snack! These are crunchy cookies with pecans and little bits of gooey caramel mixed in. Then they are dipped in chocolate!Pecans, caramel and chocolate meld together deliciously! I love them with a cup of tea at the end of the day! The low calorie count makes Nonni's an easy choice! Individually wrapped - perfect for on the go snacking! You can find Nonni's Biscotti at your local retailers, be sure to visit Nonnis.com for additional information. 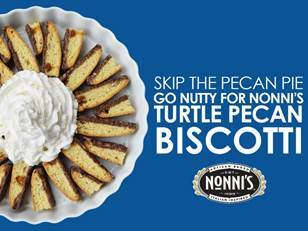 One lucky reader will win 2 coupons for Nonni's Biscotti! With the official state pie of Texas - Pecan Pie! I never knew about National Pecan Day, but I'll celebrate with some butter pecan ice cream and a biscotti. Eat some and make some cookies with them. I want to make a Caramel-Pecan Cheesecake Pie recipe I found at Taste of Home. I celebrate by eating a lot of pecans! One of my favorites! I'd celebrate with candied pecans! I would like to celebrate with some roasted pecans. When I was a child we had plenty of pecans. We had about seven mature pecan trees and there were several different kinds of pecans. National Pecan Day I didnt know there was one so I would eat a piece of pecan pie. Did not even know one existed. I love pecans and I make a really good Swedish pecan cookies that everyone loves. I am going to celebrate by making my favorite mini pecan pies. I would make some Pecan cookies!